How do you use Lisinopril and what dose? Losartan is a drug that belongs to the class of angiotensin II receptor antagonists. The substance binds to receptors in the blood vessels, causing them to narrow and the blood pressure to increase. Losartan prevents angiotensin II to bind to the receptors, which relaxes the blood vessels and causes blood pressure to decrease. Losartan potassium ensures that the kidney function in patients with type 2 diabetes and high blood pressure decreases more slowly. Losartan is prescribed by a doctor to children from 6 years and adults with high blood pressure (hypertension), when someone has thickening of the left ventricle and heart failure when an ACE inhibitor may not be used. The doctor has informed how you should use this medication and which dosage is best for you. Look on the label of the pharmacy for the proper dosage. It is always best to take Losartan at a fixed time with at least a half a glass of water. This way you prevent that you skip a dose. If you do forget it once, do not take the missed dose, but wait until it is time for your next dose. The dosage of Losartan usually starts low and increases gradually. The maximum effect occurs after 3 to 6 weeks. Do not stop on your own, but keep using the medication until the doctor tells that you no longer need to take the drug. There are no restrictions in terms of food or drink, but watch out with the consumption of alcohol. This may enhance the effect of Losartan. Most side effects disappear after a few days. In case you are uncertain, consult a doctor. 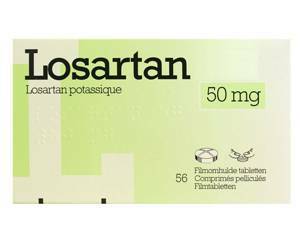 Losartan is available in tablet form in the variants 12.5 mg, 25 mg, 50 mg and 100 mg. Store Losartan potassium below 25 º C in the original packaging. Do not use the medicine after the expiration date.